Which one of these agents are potential treatment options for sarcoidosis induced hypercalcemia? In a earlier study in JAMA years ago, it was established that the hypercalcemia in sarcoidosis is 1,25 vitamin d production mediated. Classically, for 1,25 Vitamin D mediated hypercalcemia such as in lymphoma, TB. etc, steroids are the mainstay of treatment. A dose of 15-25mg/day of prednisone is usually effective. Ketoconazole is the next line of treatment for patients who cannot tolerate steroids. Since its an imidazole antifungal that inhibits enzymes in steroid synthesis, it works well. Hydrocholoroquine also causes inhibition of 25(OH), D3 1 alpha hydroxylase and can be used in some patients that have side effects to prior two meds. MTX and Azathioprine can be used to treat systemic disease that might have effect on calcium as well. ACTH has not been studied in this arena. Pamidronate has been used in case reports but the mechanism of hypercalcemia doesn't really support the use of that agent. Hypertension in dialysis patients is hard to manage. In over 90% of the cases, the cause of volume. Salt and water intake and inability for fluid removal remains the most like cause of HTN in ESRD. Few cases are renin mediated as well. Which anti hypertensive medications have the best effect in the few cases of HTN that is not treated with volume removal? ACEI/ARB would be the most obvious choice. Randomized trials in non ESRD hypertensive patients have shown that LVH is significantly improved and preventing cardiac morbidity and mortality with ACEI/ARBs compared to Beta Blockers. A recent study in NDT 2014 by Agarwal et al. was a randomized trial of atenolol and lisinopril in ESRD patients(HDPAL). 5. These results hold most true for black patients. 2. Counter to what may have shown in non ESRD patients, this study showed that atenolol was better. 3. Atenolol is renally cleared of all the beta blockers and number of patients that are non anuric might matter as it might have had more clearance and less of a heart rate effect. Interestingly, that variable was well matched as well. 4. Although not sure of significance, less atenolol patients had coronary artery disease and significant number of them had re vascularization procedures. This may be a big weakness as going into the study, there were less sicker patients in the ACEI arm from a cardiac perspective. 7. There was no placebo arm and most patients were black – perhaps hard then to generalize to all races. 9. Interestingly, it says at the end of the manuscript: received for publication Dec 2nd 2013 and accepted in revised form on Dec 4th 2013. That is strange that a paper can get peer reviewed, revised and gotten back for accepted form in 2 days. Hopefully that was a typo. A recent review in KI 2014 discusses this very important question we face in day to day care of CKD patients. If they have active cancer and CKD- what do we do? What is the Hgb target? If they had a past history of cancer- what do we do? Hazzan et al review these exact questions. Few take home points from the review. 1. Based on review of oncology literature:- there is an increase in mortality risk with ESA treatment in cancer. This risk is clearly when ESA is used outside the realm of chemotherapy and the risk may depend on type of cancer but data is not clear on that part. 2. ESA and having cancer itself pose a thromboembolic risk as well. 4. What to do with CKD and ESA use when patient also has cancer? Active cancer:- prior initiating ESA- use PRBCs and correct all reversible causes. If ESA to be used, the authors suggest a target of 10g/dl ( more conservative) and have to treat under the APRISE REMS program( usually heme/onc has to do this) and monitoring of embolic events. What to do with CKD and ESA with patient with past hx of cancer? If not cured:- treat as if they have active cancer- target of 10g/dl. Dilatation of the calyces, renal pelvis and ureters is classically what we observe in sonography to make the diagnosis if obstruction. In some cases, a phenomenon of non dilated obstruction does happen where no signs of obstruction can be noted in US or CT scans. Why does it happen?- RP fibrosis can perhaps interfere with peristalsis and lead to non dilatation, RP carcinamatosis can encase the ureters and renal pelvis producing obstruction without dilatation or could this be a chronic incomplete obstruction are some suggestions based on the authors. Treatment is usually diagnostic. Given the pathology and the cause of the obstruction being present after an ureteral stents are placed, they usually only temporize the treatment. Percutaneous nephrostomy is usually the best procedure in such situations. Here are some other studies regarding this interesting entity. 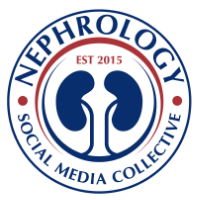 The nephrology match this year in 2013 was a tough battle for many programs. Interest in the field continues to be low. Its’ sad to note that the current generation of residents/students would rather choose a field based on compensation and work hours rather than passion and dedication. Tejas Desai from ECU just wrote a commentary in F1000research on his thoughts on how to fill seats in the nephrology match process. Interesting ideas put forth above. In addition, check out the summary of some of the twitter comments and discussion regarding the proposed ideas. 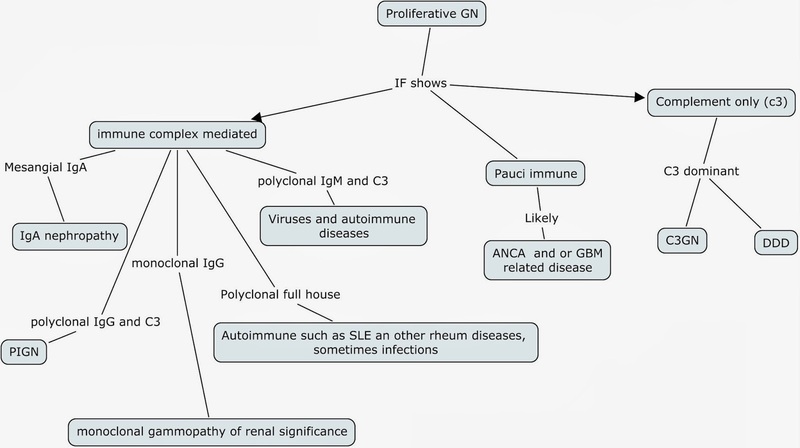 Concept Map of Proliferative Glomerulonephritis: a novel classification?